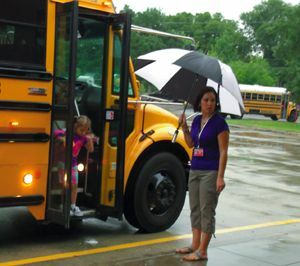 HARRIS COUNTY  This year the first day of school was a wet one and the excitement and fear was palpable on the faces of those whose absolute first day of school was Monday. Among the big local accomplishments on lowering first day hassles Crosby ISD streamlined their enrollment and re-enrollment with new forms that can be downloaded at home and submitted with less waiting. Returning students, re-enrollment forms were pre-filled in with previous information given, but with fewer pages and no repeat sections. On the morning of August 27, 2013, a female intermediate student was approached at her bus stop in the Newport neighborhood by a Hispanic Woman with Blonde hair around the age of late thirties to early forties. The woman in question was allegedly attempting to lure the student to her vehicle by posing as her mothers friend and enticing her with jewelry while calling her by the name of Amber. That name was unknown to the student. The car was identified as a burgundy/red, late model Nissan Versa. The student did not approach the vehicle, and the vehicle sped off once the students bus approached. HIGHLANDS  Out behind the house, Rotarians are practicing their washer throwing techniques in preparation for the upcoming 7th Annual 3-Hole Washer Board Charity Tournament, to be held next Saturday, September 14th at Charlies Ice House. Charlies is at 906 N. Main Street in Highlands, and the tournament starts at 12 noon sharp, lasting until 4 p.m. This event has become a city-wide tradition, with two person teams coming from various clubs around the Rotary 5890 District, as well as local Highlands folks, to compete for bragging rights and the three top positions in the double elimination tournament. Teams are also expected from North Shore and Baytown clubs. The public is invited to field a team, also. You are welcome to come and watch if you dont play, and there will be refreshments, and live and silent auctions. It is expected that about 50 teams will compete in the tournament. Entry fee is $50 per team, and all proceeds go to the Rotary Foundation, for worldwide projects and also local projects. Additional information is on the ad inside this issue. To enter a team, please call club president Aaron Cole at 281-743-3683 or Patricia Scott at 281-426-3558. Last years winners were #1 Team WISHY WASHERS, or Robert York and Clinton Forsythe. #2 Team was RINGERS, Justin Graves and Brandon Sweeney, and #3 Team was DEAD RINGERS, Dane Listi and Jeremy Rosenkranz. These teams will be at the tournament to defend their reputation, we have learned. HUFFMAN  Jack Morman, not Cactus Jack Cagle, now represents this area to the Harris County Commissioners Court; meaning that Precinct 2 has assumed the responsibility for almost all of the spraying for mosquitos and other county services near Lake Houston and the San Jacinto River. Precinct 4 Commissioner Jack Cagle held a catfish dinner on Aug. 15 at the I.T. 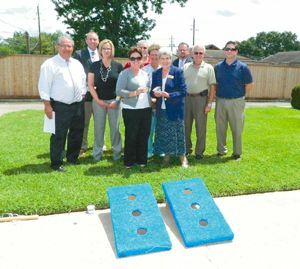 May Community Center to introduce Precinct 2 Commissioner Jack Morman. The redistricting plan that was drawn by the legislature was changed following submission and pre-approval by the United States Justice Department in 2011. 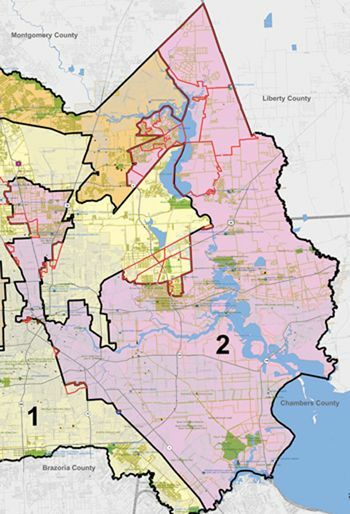 Harris County Precinct 2 would be the largest in land area and has been designated a Hispanic Opportunity District. The plan was delayed by a lawsuit. On August 2, U.S. District Judge Vanessa Gilmore struck down a lawsuit filed in 2011 and having been fought in court since November of 2012. Several scenarios were presented as alternatives and several compromise versions were offered to settle the suit but Congressional District and County Precincts were uncertain even during the 2012 election. Finally, the federal judge determined that attorneys representing the Latino community had failed to prove that the redistricting submission was unconstitutional due to the Voters Rights Act or that race was a predominant factor in the design of the plan. Morman, elected to Harris County Commissioners Court in 2011, is a graduate of Deer Park High School and Baylor University Law School. Since he presided over the Crosby area , he almost immediately implemented plans to be the infrastructure Commissioner and began in Crosby, Better Streets 2 Neighborhoods, which started work on local roads some of which the commissioner found had not been updated in 30 years. Currently, in the Newport Subdivision South Diamondhead Boulevard is currently undergoing a conversion into an actual boulevard. Morman mentioned updates to ball parks at the I.T. May Community Center during his talk at the Huffman dinner. He expressed a wish to hear from the community on what changes and needs the Huffman community feels important. Harris County Precinct 2 can be reached by the computer savvy by visiting www.hcp2.com or call 713-755-6220. Items of confusion related to the redistricting plan were pointed out at the Crosby-Huffman Chamber of Commerce New Educators Luncheon. U.S. Congressman Ted Poe, R. Texas District 2, had a representative attend and say, We really miss Crosby, many local residents are not aware that they are now represented by U.S. Congressman Steve Stockman, R. Texas District 36. Stockman did not attend the meeting, nor did a representative of his. Wayne Smith, R. 128th Texas House District now represents Crosby and the portion of Huffman that is just a mile or so north of FM 1960 at FM 2100, west about a mile. Dan Huberty, R. 127th Texas House District represents the rest of Huffman, west to Humble. In law enforcement, Precinct 3 Constable Ken Jones heads patrols of the same area as before redistricting for Huffman. CROSBY  The 2013 New Educators Luncheon brought much of this area and neighboring Huffman to the American Legion Post 658 on a bright and sultry Wednesday. For the 26th time, the emphasis of this areas Chamber on quality education was evident and participation at a maximum. Susan Armstrong having headed the Education Committee for years with support from Venita Smith passed the torch to Judy Sirocka of Crosby Office Supplies, to head up the planning for the event which went smoothly. The Superintendent of Crosby ISD, Dr. Keith Moore and Superintendent of Huffman ISD Dr. Benny Soileau introduced their principals of each school and the principals introduced the new faculty. Both Superintendents alluded to a cooperation between the schools and a competition. Dr. Moore jested that he had found a playbook of Huffman Falcons Football team, Dr. Soileau admitted he had planted that playbook for Moore to find in the interest of full disclosure. Crosby Church provided teacher supplies arrangements at each table that were decorative and practical. Representative Dan Huberty R., 127th District, lavished gifts on both districts. Huberty is a strong proponent of efficient and quality education having served as Chairman of the Humble School District before his Texas House election. United Community Credit Union was chief sponsor and competed with Community Resource Credit Union for best prize contributor. Goodybags of items from local businesses were offered to each of the new educators seperated for Crosby and Huffman teachers. The next C-HCC meeting is the picnic in the park to be held Sept. 19 at the Precinct 2 Park behind the Crosby library with special booth and emphasis on efforts of the Beautification Committee. CROSBY  The tax increase was accepted 6 to 1 by the vote of the board, there was no public comment. At the public hearing concerning the new budget for Crosby Independent School District no member of the public came forward to tell the school board that holding bond elections within the schools to benefit from them was in any way questionable, or that a new tax just before the implementation of affordable healthcare goes into effect might imperil local property owners, so the will of the courageous people was enforced. No complaint was represented. Other than board members, new administrators and key teachers, no one showed up except a reporter last Monday. Joann Crawford was the single dissenting vote and attributed that to a legal issue that has a pending legal opinion. She said she did not have an opportunity to bring forth the legal issue. The proposed maintenance and operations rate ($1.17 per $100 valuation) is the same as last year, the Interest and Sinking debt service tax rate will rise from 27¢ normative to 50¢. In total as published in the Star-Courier on page 6 July 25 was and is $1.67 per $100 valuation from last years $1.44 due to the rollback tax. A bond referendum vote was held May 11. A single amendment was made in the motion to change from the 132th day of August to the 12th of August for the date enacted. The board will tackle issues like are private tutors allowed in the classrooms during school hours. President John Lindsey asked to see a new telephone list and the board has asked for an organizational chart. 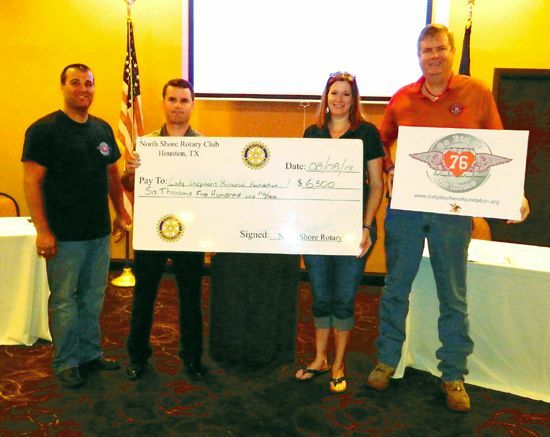 NORTH SHORE  The Rotary Club of North Shore made several check presentations at their last luncheon meeting, to show their support for community activities in East Harris County. Included in the awards were a check to the Cody Stephens Foundation for $6500, to pay for ECG screenings for pre-participation high school athletes; a check for $11,000 to San Jacinto College North, for partial tuition for high school students that have been taking dual-credit college courses with their normal high school classes, at Crosby, Channelview, Galena Park, Holy Trinity, and Sheldon high schools; and a check for $1200 to the VA Hospital Hospitality Fund, awarded through the Crosby American Legion Post #658. In accepting the check, Scott Stephens spoke about the need for pre-participation ECG screenings for high school athletes. After the death of his son Cody from an undiagnosed heart condition, Scott became aware of the large numbers of athletes nationwide that have died from heart abnormalities that were not known beforehand. He vowed to help change this condition, and established the foundation to help pay for ECG pre-participation screenings, and he embarked on a speaking and appearance schedule to make people aware of the problem, and the solution. To date, 800 athletes at Crosby ISD, and 500 at Galena Park have been screened, with other districts interested or also participating. Galena Park (2 high schools). A Barbecue Fund Raiser is planned in Crosby, on Sept. 28 at 7 p.m. at the American Legion Hall. A raffle for a new cooker will be held, as well as a dance, auction, and dinner. Stephens plans on continuing his fundraising and campaign to provide screening for athletes. 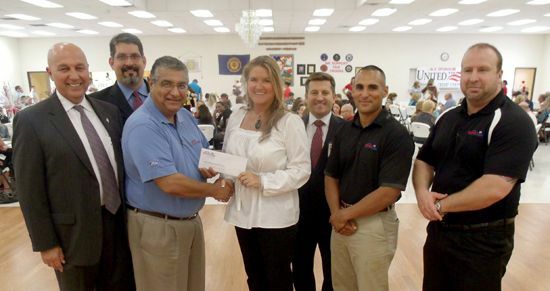 Also receiving a check, for $11,000 was San Jacinto College North, to pay for partial tuition for students that are taking dual credit courses, and will get college credit and an Associate degree when they graduate from high school. They will then be able to continue in a 4 year college, entering as a Junior, said Dr. Allitia Harris, president of San Jacinto College North, and president elect of the North Shore Rotary club. Director Jennifer Mowdy reported that 30 students graduated this year in the program, including 11 from Crosby graduating this year, and 7 next year. MECA stands for Modified Early College Academy. Also receiving a check for $1200 was the American Legion McNerney Post #658 in Crosby, who will use the money to fund a hospitality welcome suite at the VA Hospital in Houston. American Legion commander Bob Boyles said this makes visiting veterans and their families more comfortable and feel welcome as they wait for their medical procedures at the VA facility. CROSBY  Another case of failure to yield right of way was fatal for a man and a dog, a young woman and another dog were critically injured at the intersection of FM 1942 and Bohemian Hall on Monday morning. It was about 10:40 a.m. on August 6 when a southbound green older model F-150 on Bohemian Hall Road approached a stop sign that has lights and signs warning of the intersection directly between Crosby and the oil production fields for most of the world. 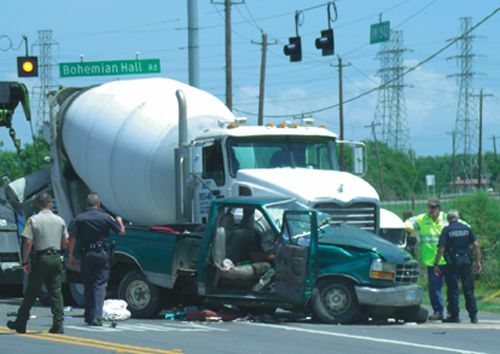 At the same time a white cement truck was westbound on FM 1942. According to Traffic Investigator Harris County Sheriffs Deputy L. Hernandez, The westbound driver approaching the Bohemian Hall intersection sees the green truck didnt stop, it just entered the roadway. He tried to brake and couldnt stop in time and struck the truck at the drivers side. Raymond George Wike, Jr., is listed as the driver of the green vehicle according to Harris County Sheriffs Traffic Reports released Tuesday, the name of the woman has not been released. There were two young dogs, aboard the F-150, one died on impact and the other was taken to a local veterinarian by Harris County Emergency Service District #5, the ambulance service for Crosby. Jesus Sauceda, the driver of the white concrete mixer truck, was transported by HCESD#5 to a local hospital said to be shaken up and for minor injuries according to reports on Tuesday. The Harris County traffic Enforcement Division is still examining this accident and an investigation continues. Meanwhile the Keystone XL Pipeline battles hurdles to come to Mont Belvieu and the Port of Houston is on schedule to provide most of the U.S. export to the Panama Canal, the canal completes its expansion in 2014. FM 1942 connects Crosby to Baytown and Mont. Belvieu. 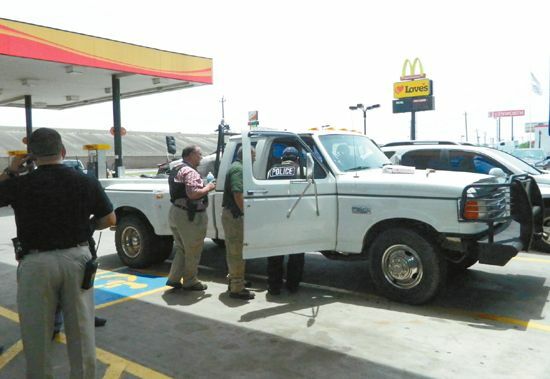 Baytown police and their SWAT team answered a call last Friday from Loves Truck Stop on I-10 at Thompson Road, where an irate person had entered the store screaming for the clerks to call the police because he was going to shoot everyone. The incident started around 11:30 a.m., as the man later identified as Eric Scheele, 53, from Highlands, entered wearing only underwear, and carrying an object in his hand that was at first thought to be a gun, and later a cell phone or similar object. After the initial outburst, Scheele reportedly retreated to his truck parked in front of the store, as the police were called. Upon arrival with a large contingent, including the SWAT team, the officers surrounded Scheeles truck and began to negotiate with him. Police moved everyone to a safe location at the back of the store, and warned nearby businesses. They also blocked his truck with an armored vehicle, as they attempted to calm and control the situation. They did not know if Scheele was armed, and could hear him muttering to himself, and eating. He also had something in his lap, which at first was thought to be a weapon, and later turned out to be food. He resisted the police attempts to talk or take him into custody, taunting them to shoot him. After about two hours of the standoff, with by-standers and television helicopters watching the drama, the police managed to talk him into surrendering. Scheele was then taken to the Harris County Psychiatric Center in Houston, to be evaluated. At this time he has not been charged with any crime, pending the psychiatric review. Authorities say that the Sheriffs office has dealt with him before for similar activities. 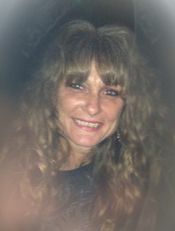 A Funeral Fundraiser for Donna Schumaker will be held at Tugboat Marina, 1322 Clear Lake Rd. Highlands, Texas at 2:00 p.m. Saturday, August 3 until 8:00 p.m. with a Celebration of Life to be held from 8:00 p.m. until 1:00 a.m. Auction donations are being sought. Varied events including Roses on the Water will be conducted in honor of this lifetime supporter of Highlands. HIGHLANDS – Harris County Sheriffs Homicide detectives say that a break-up of roommates led to a female friend of one of the roommates being shot to death. Neighbors heard shouting and arguing Friday night prior to the sound of a gunshot in the early morning of Saturday. Sometime after 1:30 a.m. Saturday on the north end of Highlands at 318 Greenbow Lane near Lochness in Highlands, Charles Ivey, 32, allegedly discharged a single blast from a shotgun. Charles Ivey initially told law enforcement investigators that he shot Donna Schumaker, 41, while defending himself during an altercation. After saying the shooting was in self-defense, Ivey later confessed to hiding a knife near the body of Schumaker. The Highlands man is being held in Harris County Jail on $50,000 bond charged with murder. He contends that Schumaker had come between he and his roommate and was arguing with him according to investigator Sgt. Robert Spurgeon of HCSO Homicide Division. Saturday evening, Ivey appeared in magistrate court. In court, it was revealed Ivey has no felony record. The murder charge carries a possible punishment of five years to life in prison.